In this capitalist world, it’s imperative that children learn about financial literacy early on. What do you do when you have to sit down with your child and explain the facts of life? Do you squirm and pass the buck on to your partner or another handy grown-up around you? Or do you sit down and tell it like it is – all the things about bulls and bears, currency exchange, and government regulations? With all the economical chaos that has erupted in the last week, now’s a good time to chat with your children about money and get them financially literate. Pratham Books’ aim is to promote reading, and Kumar said that they decided to make financial literacy simple and clear so that young children could enjoy reading and at the same time, imbibe money sense. “Understanding money makes so many things clearer for children – why their parents work, why families do things the way they do, why prudence and thrift are values that families pass on and so on,” explains Kumar. Illustrated by Deepa Balsavar, the four books are a fabulous edition to the library. So You Want to Know About Economics , which will be published by Red Turtle, looks at topics such as macroeconomics, microeconomics, trade, taxes and budgets. As a parent, Pai elaborates that she would take her children to the bank to stand in line for an hour or two. This would help them understand the inconvenience felt by people around them and place it in the larger context of the government policy. Pai would encourage them to think how they can help people, such as their household help, who maybe facing a cash crunch. “I would ask them to think about how privileged they are, that they can actually carry on for a long time without using cash at all, and how good it would be for the country if everyone eventually got there,” says Pai, who has also edited a set of math volumes for Pratham Books’ digital platform, StoryWeaver. Another way to introduce children to the concept of money is to take them to the Reserve Bank of India Monetary Museum in Fort. It’s a wonderful space for children to understand where their money comes from and its history, currency management in India, and the RBI’s function. The RBI even has a basic microsite, Financial Education, where children can put together jigsaw puzzles of currency notes to understand its design and read short stories. Not the best of designs or concept, but it’s a start, perhaps, especially as it’s available in multiple languages. Apart from that, the National Council of Educational Research and Training has Personal Finance Reading Materials available online, about the basics of financial planning, investment, and taxes. The website vikaspedia.in has several such examples, including a link to Pocket Money, a financial literacy initiative for students developed by the Securities and Exchange Board of India and National Institute of Securities Markets. Both Pai and Kumar stress the importance of enabling children to take an interest in financial matters. “Financial literacy has to be part of the skills that children learn at home along with other life skills,” says Kumar. “The transfer of knowledge has to be organic. Rather than give them lessons, take children with you when you go to the post office or bank. Help them start a bank account when they turn ten. Allow them to keep and manage their own gift money however small or big the amount is. Maintain a democratic process of discussion and debate around regular family budgets.” Pai recommends talking to children about compounding, the importance of money and how it is earned through hard work, why the government imposes taxes and why it’s vital to pay them, and encouraging them to be entrepreneurs, to earn their own money off school time. In a capitalistic world, it is increasingly becoming important for parents to ensure their children also grasp the social complexities and the idea of privilege. “I think it’s even more important to weave life lessons into it,” says Pai. “You should save for a rainy day, but how much? There’s nothing wrong in spending the money you've worked hard for, but should there perhaps be another column in your Spend-Save account-keeping book, titled ‘Share’? Is it always okay to have premium services for people who can afford it so that you get to stand in shorter lines? Should people have access to the best doctors only because they are able to pay more, or should it be based on the criticality of their illness or whether they stood first in line? Communism has been trashed as a failed system, but is it really that impossible to create a more equitable world in more formal ways? 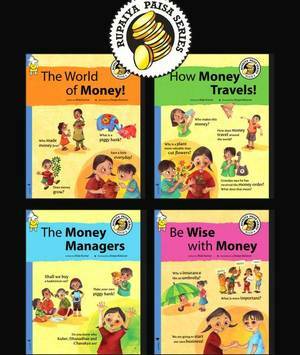 Is money really everything?” It’s imperative the discourse starts early, for children to gain important knowledge as well as formulate their own ideas and thoughts about money.